Delve into centuries of Madrid's history during a guided walking tour of the Spanish capital city, followed by an evening flamenco performance. Spend two hours exploring Madrid's oldest neighborhoods with your guide, seeing landmarks like the iconic Plaza Mayor, the Arch of Cuchilleros, and some of the city’s oldest buildings. Then sit down and enjoy a professional flamenco show at Flamenco Torres Bermejas, one of Spain's most famous venues. A tapas dinner is included. No drop off. At 6pm, make your way to the meeting point in central Madrid for a guided walking tour through the old quarters of the city. See the impressive Plaza Mayor, walk down the stairs of Arch of Cuchilleros, and explore the winding streets and alleys around Plaza de la Villa. 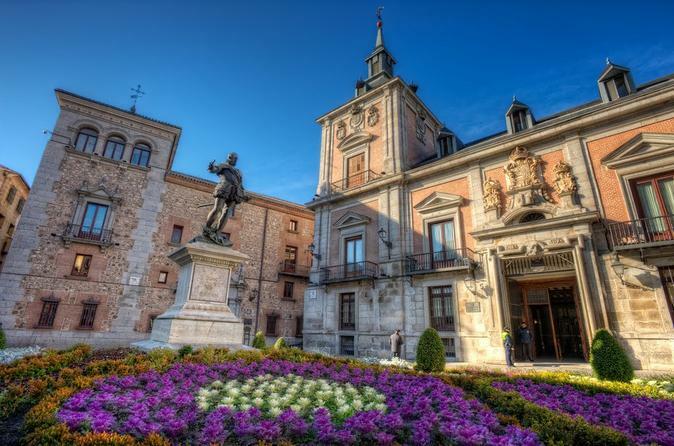 You will see some of the oldest buildings in the core of medieval Madrid; including the House and Tower of Lujanes, where French King François I was kept as a prisoner by Spanish Emperor Carlos V. Admire the neoclassical architecture of the Cathedral of Almudena, and stroll through the beautiful Plaza de Oriente.